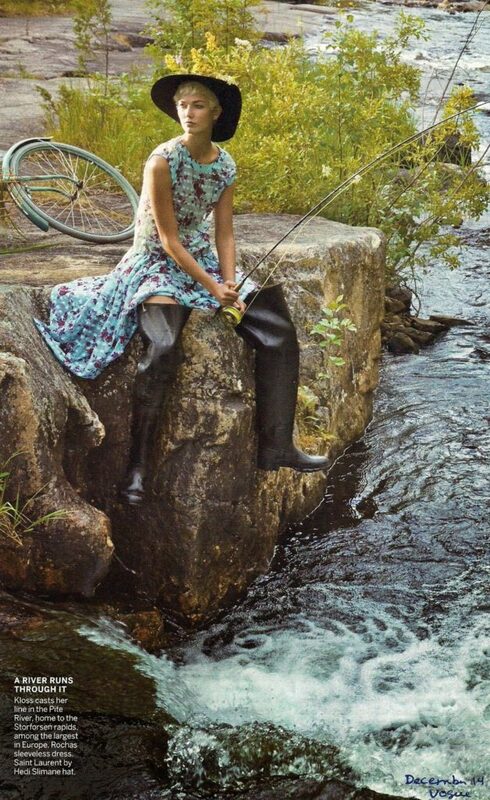 I came across this picture of Karlie Kloss in a Saint Laurent dress and hip waders in the December issue of Vogue. Is this streamside chic … or what? I’m sure this outfit is what my colleagues imagined I’d be wearing whenever I’d mention at work that Hubby and I had been fishing on the weekend. Well, it’s what they imagined until they got to know me better. Until they discovered what the other half of my life was like. You see, I’ve always been equal parts city and country, part girly-girl and part tomboy. Fifty percent fashion and fifty percent fishing, or something. Ever since I was a kid. I remember the summer I was ten, my older brother Terry and another boy in the neighbourhood worked all summer for my grandfather who owned a well-drilling company. Well-drilling is kind of the family business. My mum’s father and all my uncles and now my brother… all well-drillers. They loaded and unloaded pipe, and scraped and painted every bit of machinery Grampy owned. I helped. Seriously, I got up every morning and went to “work” with Terry and Albert. I loved it. According to my mum, I’d come home in the evening covered in grease and paint and insist I had to drink my tea from a china cup and saucer. You see, I was part grease monkey, part lah-di-dah lady. I’ve never minded getting dirty. And I’ve always fished. First with my brother Terry; he’s nine years older than me, and when I was little, he’d take me trout fishing. He even bought me my own fishing rod when I was nine. Later I fished with Terry’s father-in-law who was an avid sportsman. And with my step-father and step-brother. And then I met my husband. There probably aren’t words to describe how much Hubby loves fishing. We met in the staff room of the high school where he taught Phys. Ed. and where I was supply teaching. I was wearing high heels and my navy skirt suit. I know I probably looked as if I thought stuff like camping and fishing was “ickky.” So imagine his surprise when he discovered that I liked fishing too. Okay, I will admit that I knew nothing about camping and canoeing when we met. But I did know fishing. And the other stuff… well, I was game to try. 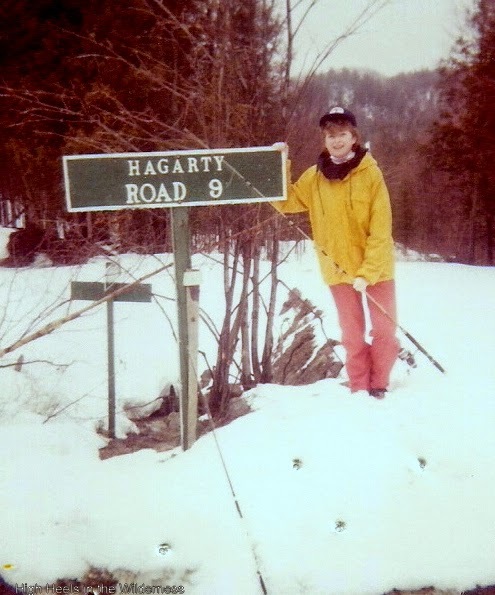 This is me, below, in early spring 1985. Hubby and I had started dating a few months before. We decided to go trout fishing over the Easter weekend. The weather in Ottawa had been beautiful and warm for weeks; we had no idea that there would be so much snow in the hills overlooking Brudenell Creek in the Ottawa Valley. I’m wearing Hubby’s rain gear here. You could call this outfit an early example of colour blocking, I think. No fish to be had that day. Still, I look like I’m having a good time. Must have been love, eh? This is me in 1987 or so. 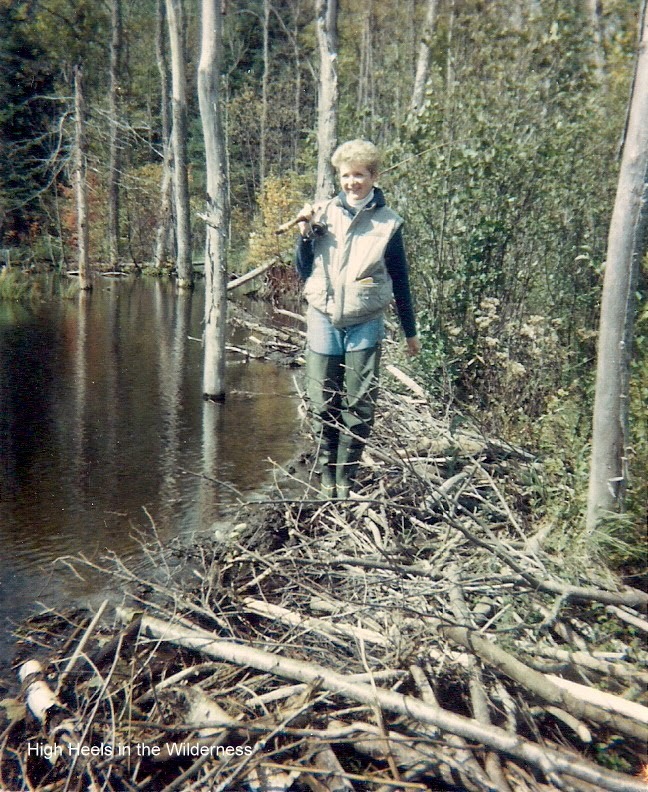 Hubby and I were fishing for brook trout in a beaver dam. I think I look quite fetching in my hip waders. Actually they were Hubby’s boots. He bought me my own for Christmas a few years later. I remember that I couldn’t wait to drop that bombshell at the lunch table at work. “What did your husband get you for Christmas?” Yep. Hip waders. I definitely won the prize that year for most surprising gift. Okay, so fishing isn’t all sunshine and roses. That is definitely not a smile on my face. 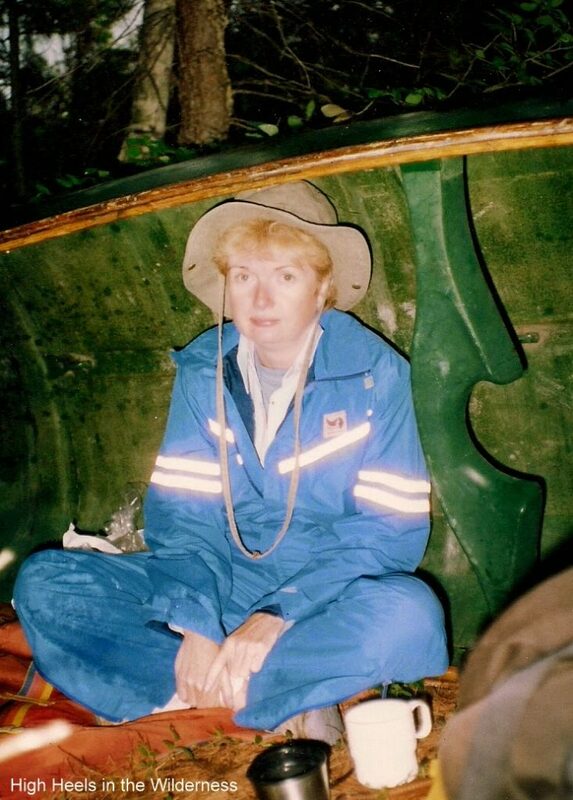 Hubby and I were on a canoe trip in Algonquin Park, probably mid- 90’s. It had been raining. Hard. I was soaked. 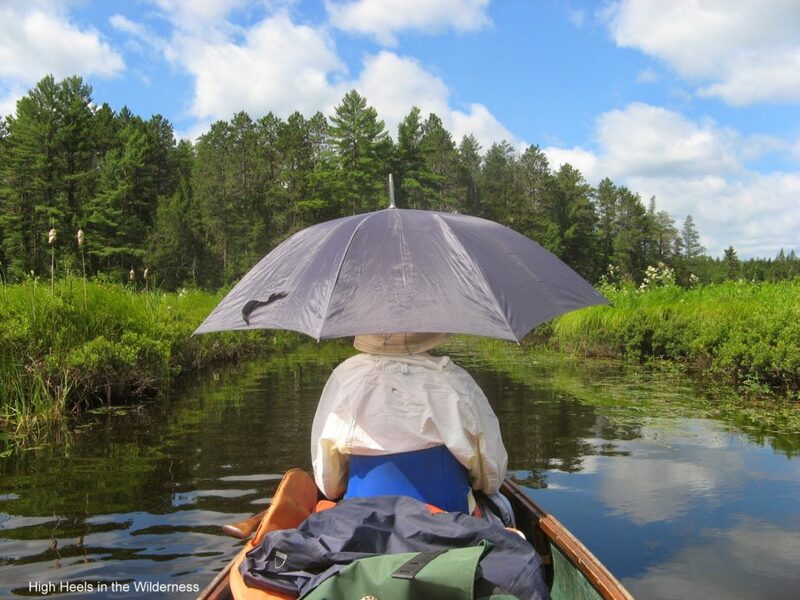 We stopped for lunch and it was raining so hard we had to shelter under the canoe. The canoe smelled of fish; even my sandwich tasted fishy. Did I say I was soaked? So… no sunshine, no smiles, and most definitely no roses. But later that day, the sun came out, and we dried off. And carried on fishing. 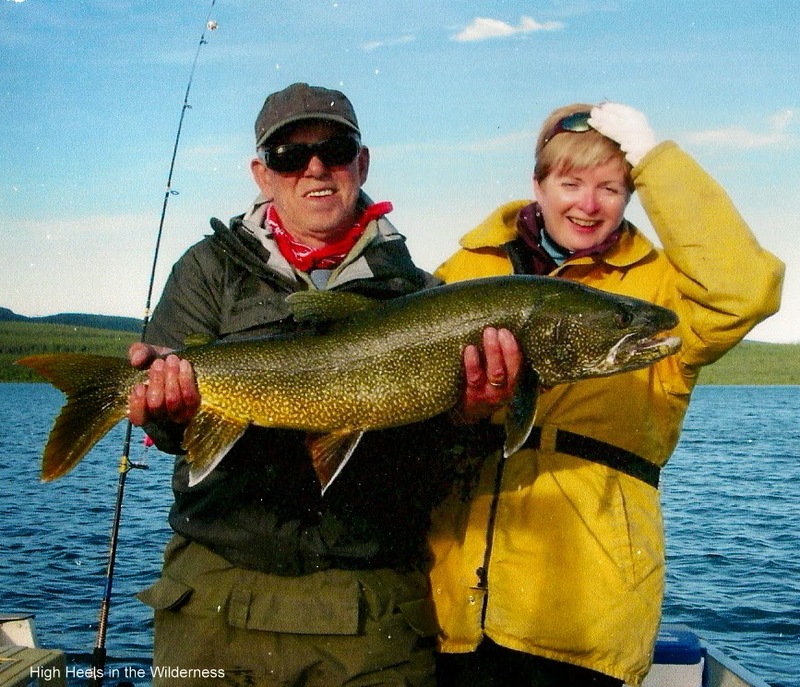 This is the big, big fish that I caught in the Yukon in 2006. Oh. My. God. That was hard to reel in. The guide kept yelling at me…”Keep your rod tip up! Keep your rod tip up!” And I kept gritting my teeth and replying…”I’m trying. I’m trying.” We’d been fishing since 6:30 in the morning, and I was pooped. And I couldn’t feel my arms anymore. The picture says it all, actually. By the way…this was a catch and release lake. And the guy holding the fish is not Hubby; that’s Doug, our guide. Most fishing days are not as fraught as that day in the Yukon. 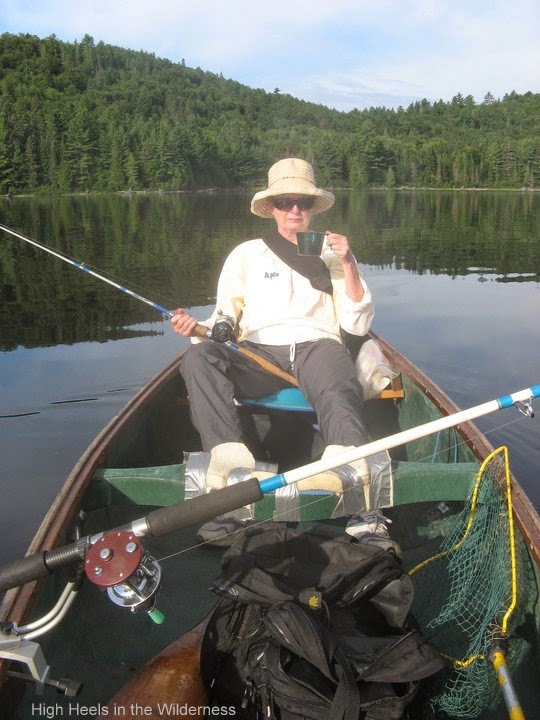 I much prefer a quiet lake in Algonquin Park, just me and Hubby, our Kevlar canoe and a nice cup of tea. This is a shot of an early morning fish on Booth Lake in Algonquin Park in 2010. In order to get me out of my sleeping bag and into the canoe at a time that Hubby considers reasonable and I consider the crack of dawn, he uses bribery. Fresh muffins and a thermos of tea. And the promise that I can read my book once the trolling lines are set. I mean I do love fishing. Just not as much as Hubby loves it. So you see, fishing and camping, and even well-drilling, is the other half of my life. The “wilderness” part, not the “high heels” part. And that’s where the name of my blog originated. One half of me loves clothes and make-up and obsesses over my hair and the other half just wants to get down and dirty, so to speak. You might say that one half of me lives at the mall… and the other half in the bush. I started thinking about writing this post when I saw that shot of Karlie Kloss in Vogue in December. And then today I read a post on Not Dressed As Lamb about blogging and how bloggers should make sure that readers understand the meaning of their blog title. And I thought that maybe it wasn’t clear to readers of my blog where the title High Heels in the Wilderness originated. So now you know. 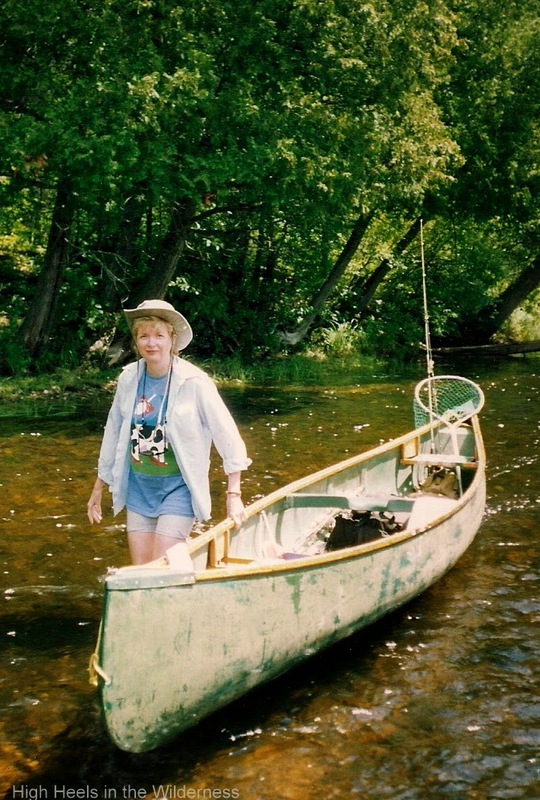 The shot below was taken on the Bonnechere River. One hot, hot July day in 2011. This is me doing my impression of Katharine Hepburn in African Queen. Every fishing fashionista need a parasol, don’t you think? It’s the very epitome of streamside chic. How about you? Do you have any seemingly contradictory parts of your nature? Linking up today with Casual Friday, Visible Monday, Style Me Wednesdays, What I Wore, Fun Fashion Friday, All About You. Being a Teenager Can Be Murder… Literally. One must be appropriately attired and your fishing gear is spot on! High heels and boats do not mix…we have a SeaRay and I wear Sperry Top Sider deck shoes to keep me upright when underway or docking. Safety first! Keeping upright is good…and one can do it so fashionably in those deck shoes:) Thanks for reading.HotHB. Why, thank-you, Janie. I had fun writing it and remembering old times. Thanks Iris. "Fishinista" …love that. Hmmm, I came back to check your response to the comment I left earlier, but it's not here. I said I can appreciate the split between the high heels and the fishing having spent part of our honeymoon, so long ago, on a canoe trip (portage required, part of it across a cedar tree felled to form a bridge across a 50-foot span, 15 or 20 feet above a creek) — I held out for a couple of days afterward in The Empress Hotel, at the time one of the CN hotels. . . We haven't managed to keep up the outdoor activities anywhere near the way you and your husband do, although I do hope there will be more in my retirement. Sorry your earlier comment disappeared. I don't think I could carry a pack across that tree bridge. I have terrible balance and would end up in the creek no doubt! Funny you should say that about a "real high heels in the wilderness" shot. Last summer Hubby wanted me to bring a pair of high heels on our canoe trip so he could take my picture. Hmmmm. Maybe. Only a few weeks to go for you now before retirement! On Thursday this week we had blueberry/cornmeal pancakes for breakfast and then went skiing. I kept thinking…"Pancakes for breakfast on a Thursday. Now that's retirement!" No…no tightrope walking for moi. I have terrible balance. Make-up-less and in big boots is my spring attire many days as well! This was a fun post! I think it is great to see what we wear for our recreational lives…I am not into fishing, but I think it is great that you are. Keep having fun! Thanks Pam. And thanks for reading. This makes so much sense! And added to my morning quite measurably, to spend a minute imagining the wilderness. Thank you. What a lovely post! I think blogging is perfect for this sort of walk through memory story and it gives a real flavour of your life and who you are. I'm no fisherwoman, only the last two photos of sunshine and lolling in a boat in tranquil water have any appeal for me1 But I've always been a tea in a china cup tomboy mix. It's called having the best of both worlds! Thanks for the kind words. Having the best of both worlds is a good way of putting it. Thanks for stopping by. My husband loves to fish, and he would be ecstatic if I would accompany him on one of his trips. You may have convinced me! It's so nice to get a chance to meet you! We have so much in common. My husband and I spend our weekends fishing, camping and canoeing but I love to dress up sometimes too. No reason we can't be both! Loved your blog and I especially love the name! I write two different blogs one is a lifestyle blog called THE DIARY OF AN ALZHEIMER'S CAREGIVER and then I write a US travel blog called MILLION MILE BLOG! Thanks Rena. I'l definitely check them out. Thanks for stopping by.